After a false start or two, we finally have Flex Radio's Version 2 SSDR software running. It enables easy internet remote operation from wherever, using my Flex 6500 radio installation at home and the Maestro controller. Today, we are set up in the ARRL headquarters site in Newington CT, about 40 miles from home as the crow flies. Everything seems to be working well. "59" reports from Switzerland and Spain. 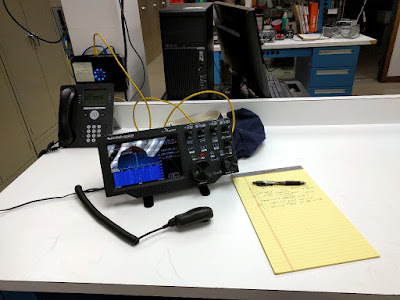 At home, I have the Flex 6500 controlling the tuning of my SteppIR 3-element beam (fixed on Europe), so I can remotely operate from 20 meters down to 6 meters. Unfortunately, there is no remote pointing control -- yet. Also, no integration with digital modes or my logging system. One step at a time.